For the longest time, my brain would not accept that a salad was anything more than a side. It is sad really, salads are such great options and can be dressed up to wow or dressed down for a simple meal. And adding a marinated lean protein or a homemade vinaigrette can transform a salad from simple to delectable! Spinach is a great salad foundation because it is so nutritious. Spinach is low in saturated fat (bad fat) and low in cholesterol. 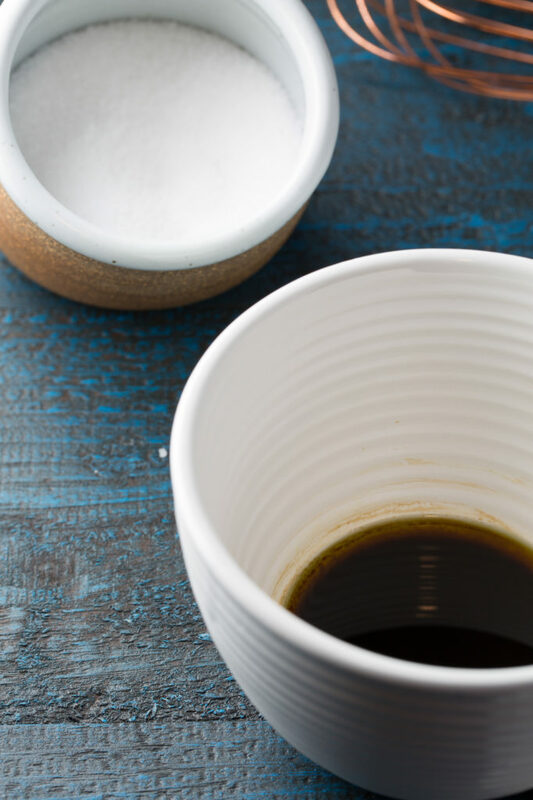 It is also a fantastic source of Niacin, Zinc, Protein, Fiber, Vitamin A, Vitamin C, Vitamin E, Vitamin K, Thiamine, Riboflavin, B6, Folate, Calcium, Iron, Magnesium, Phosphorous, Potassium, Copper, and Manganese. Whew! What an abundance of nutrition in this one little leaf! This salad is so delicious and filling it has become a regular in my household. Absolutely perfect for those “I do NOT want to cook” nights. We all have those nights, right?! My spinach addiction started when I was in my third trimester; you know when every night is an “I’m not cooking night“! I was so sick and anemic that everything I could eat had to be as nutritious as possible. This spinach salad became a key player. I was unable to take iron supplements so it was either get my numbers up with my diet or I was a week away from the doctors requiring a blood transfusion. Since the transfusion didn’t sound very appealing, I consumed a lot of spinach and took spirulina supplements. Fortunately, my iron count went up and no transfusion needed! What you eat makes such a difference in how you feel and perform! My son is now almost three, and we still consume this salad a few times a month. I LOVE to marinate a chicken breast in the homemade vinaigrette and serve on top of the mixture. I have even added mandarin orange slices, blueberries, and hemp seeds to really up the nutrition when I’m feeling blah. This version includes spinach, bacon, strawberries, almond slivers, and fresh strawberry vinegarette. 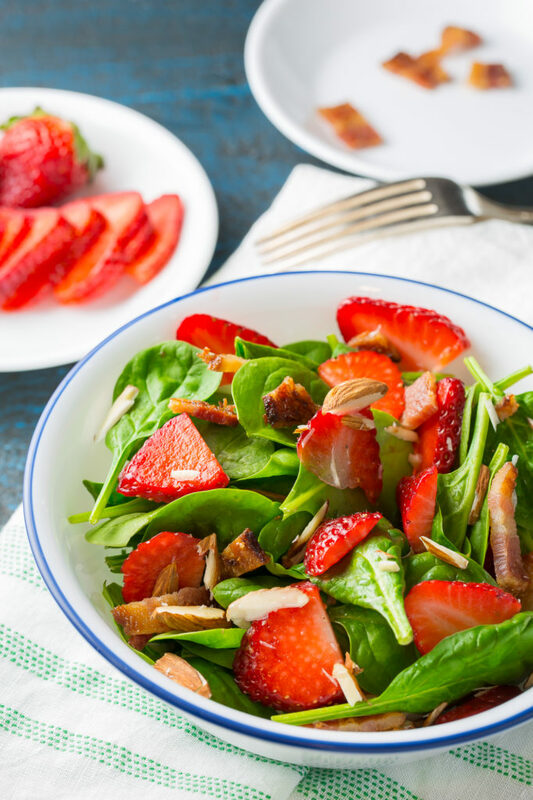 I like to make this spinach and strawberry salad with leftover bacon from breakfast. Sometimes, if I need to, I’ll make fresh bacon. If you need to do that, go ahead and do that first. While the bacon is cooking, prep your produce. Be sure to wash your produce thoroughly. All kind of nasty residues can be on spinach and strawberries. Really, you should always clean all of your produce well. We don’t want to eat pesticides or preservatives. Slice your washed berries and set aside. Time for the almonds. I like almond slivers in the salad the best. They provide a little crunch and are the perfect pairing. You can slice whole raw almonds or buy slivered almonds at the store. Either is fine. Use what you have on hand. 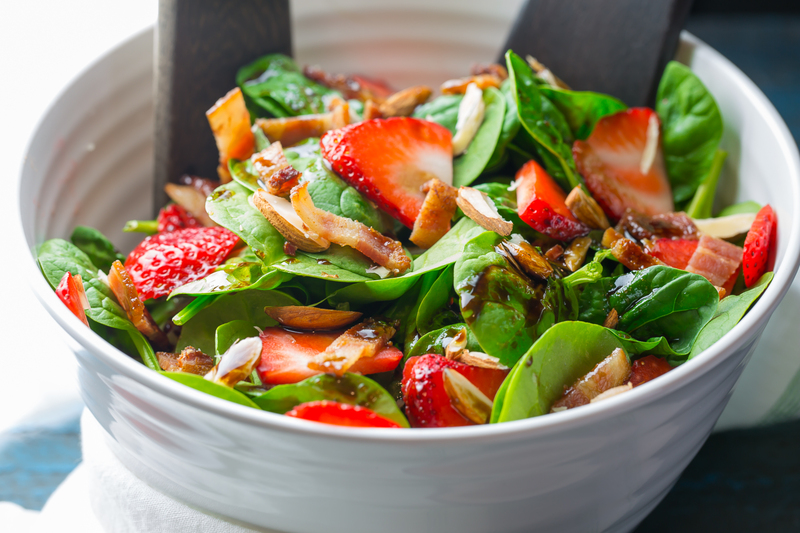 To assemble, add the spinach to a bowl, top with sliced strawberries, crumbled bacon, and slivered almonds. 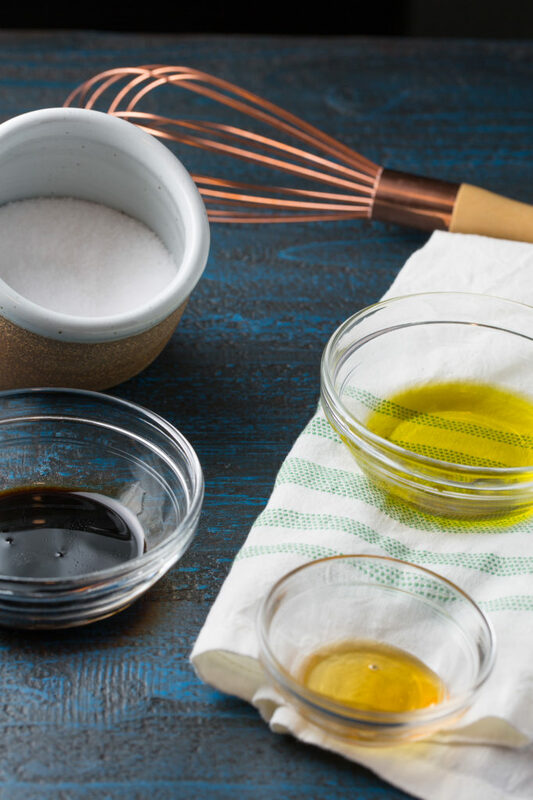 In a bowl, whisk all the ingredients together until the emulsion forms and holds. You will no longer see bits of oil separated when it’s done. Dress your salads and serve! How do you like to prepare your spinach? Wash spinach and strawberries. Place spinach in bowls. Previous PostPrevious The Tastiest French Toast Recipe Ever! Next PostNext Pork Chops with Mushroom Gravy: A Delicious and Simple One Pot Wonder! 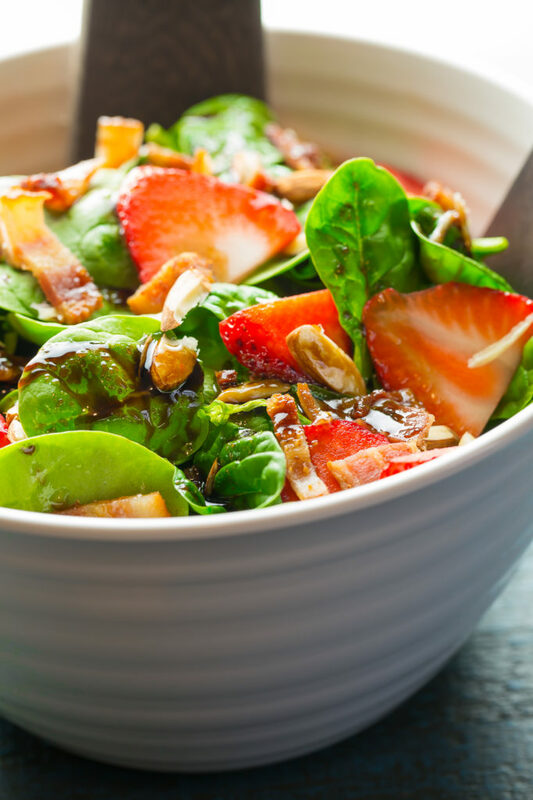 I never would have thought to put strawberries in my spinach salad – but I have added sultanas and they are perfectly delicious. This is something to consider – that is if the strawbs don’t get eaten before they get tossed in! Lol, the berries always take a hit in the prep of this salad! This is my favorite kind of salad! Light and simple!! I love spinach and all different kinds of salads. Sometimes we add a little meat most of the time we don’t. Always easy and refreshing way to throw a quick dinner together. I adore spinach salads. The strawberries add a nice touch. Yum! I love how bright and yummy this looks for spring! What our poor husbands put up with with our cravings! LOL. I’m sure mine wishes I had craved spinach so we could have delicious salads like this one. I love the strawberries and almonds on top. Thanks! ANd yes, my husband had either this or enchiladas virtually everyday. I’m so glad your iron count went up! I love spinach salads all the time, and this one looks delicious and fresh! I rarely mix fruit with savories, but strawberry salad is the one delicious exception. Your recipe looks just stunning! 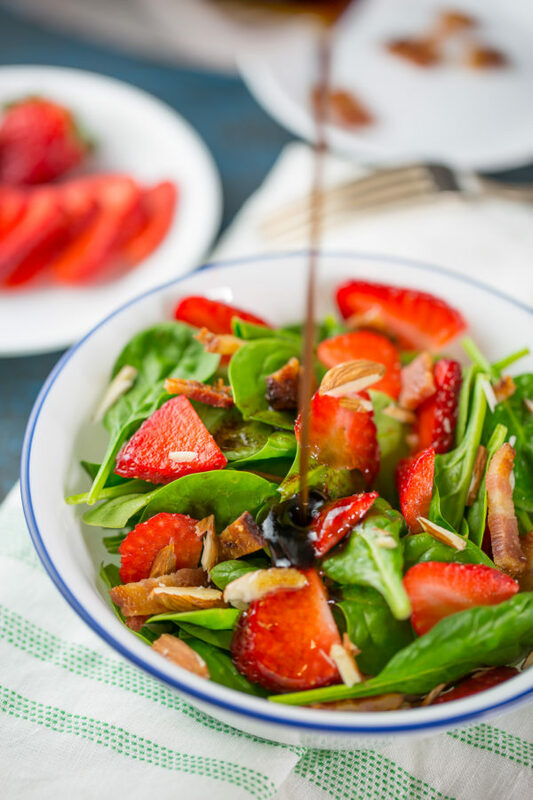 Strawberries, spinach, and balsamic are some of my favorite flavor combos! This looks soooo yummy! I don’t eat bacon, but this salad sounds divine with or without! This looks so delicious and vibrant! !